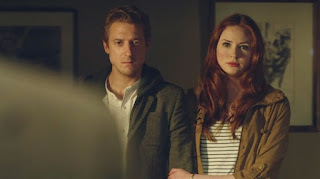 Amy Pond and Rory Williams, ever since they were first introduced with the Doctor’s newest incarnation it’s been hard to imagine one without the other. And as we’ve arrived at the end of their run the question that’s lingering is would they be separated in the end? We started the episode with a film noir style cold open where the Doctor wasn’t involved at all. 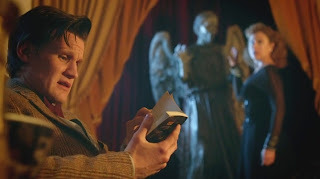 Instead we’re put into the shoes of a detective Garner in the 1930’s who’s involved in a mysterious case where the Weeping Angels are clearly going to become a threat for him. 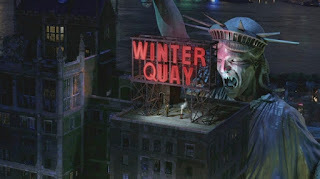 It gave us a nice introduction to a building called the Winter Quay which the Angels use as their personal time energy farm where various people are housed while their time energy is fed off of by the Angels. It’s actually quite an ingenious concept on their end as they’re able to feed on the same person over and over in a seemingly infinite time loop. 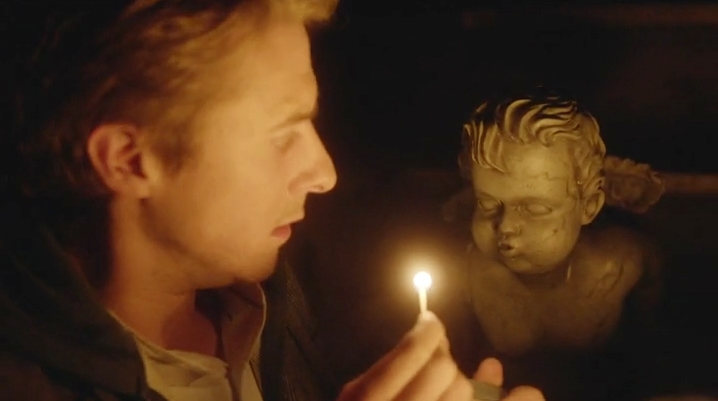 We also discovered that the weeping angels have babies; ones that terrifyingly giggle and skitter after their prey. I’ve never been afraid of the Weeping Angels myself, but those babies might even give me nightmares. Continuing on with the detective theme, in the present day the Doctor is enamored with a little novel about Melody Malone. It was pretty glaringly obvious that Melody was going to be River, but it was cute how the girl in fiction he was gushing over was in fact his wife. This is the first time we’ve seen the duo together on-screen following their nuptials, but we can only assume he’s still been seeing her when he’s not off adventuring with the Ponds. The new level of their relationship has led to a different dynamic between the two characters that was interesting to see play out. When River broke her wrist to escape an Angel’s grip, but didn’t tell the doctor about it that was a very telling moment in that it showed how well River knew how the Doctor would react. She knows the Doctor well enough to understand there are things you have to keep from him. 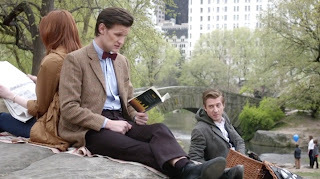 It’s possible that it was just to spare his feelings and give him hope about it not being the imminent end of the Ponds. Or that she knew he’d use some of his regeneration energy to fix it. An act she slaps him over which makes me wonder if it’s not the first time he’s used it with her, and if that small act will have a repercussion down the road. Really the core of this episode dealt with the Doctor’s god complex. The Doctor can be quite selfish on this level and, for me, this episode really drew a parallel with “The Waters of Mars.” I’ll be frank when I say that “The Waters of Mars” is not my favorite episode of Doctor Who in the world, however it was a vital piece in what ended up forming the Eleventh Doctor. In the episode, the Tenth Doctor went a bit mad with power at the end as he decided he was going to throw a middle finger at fixed points in time and save someone. An act that could very well alter the history of humanity, but it was all for nothing ultimately when the woman he saved, Adelaide, killed herself to preserve the future. 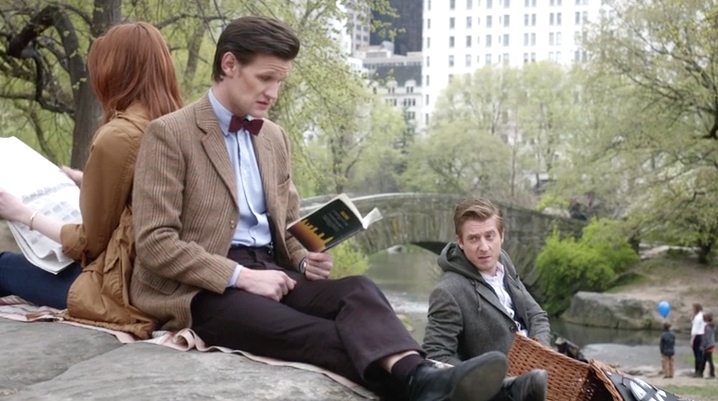 We see the very same idea in this episode with Amy and Rory as the Doctor’s personal connection with his companions means he doesn’t want to see their story come to an end. He does everything in his power to try and not put a fixed point in place and when we see Rory die of old age I can almost imagine the Doctor thinking that at least he’ll still have Amy. 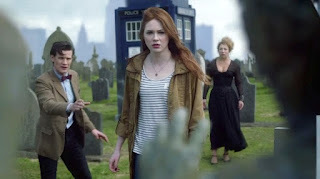 In the cemetery, if River weren’t there I almost wonder if he’d have tried to drag Amy back onto the TARDIS, or if at that moment he already knew she’d hate him if he did. He had to overcome that selfish part of himself that doesn’t like endings, which again is directly linked to how the Tenth Doctor ended and how much he didn’t want to go, and let Amy do what was best for her and for Rory. 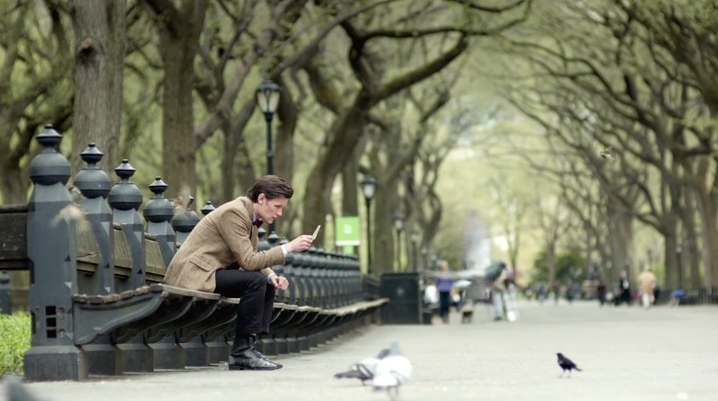 Twice in the episode Amy risks everything to save Rory a life of being alone. 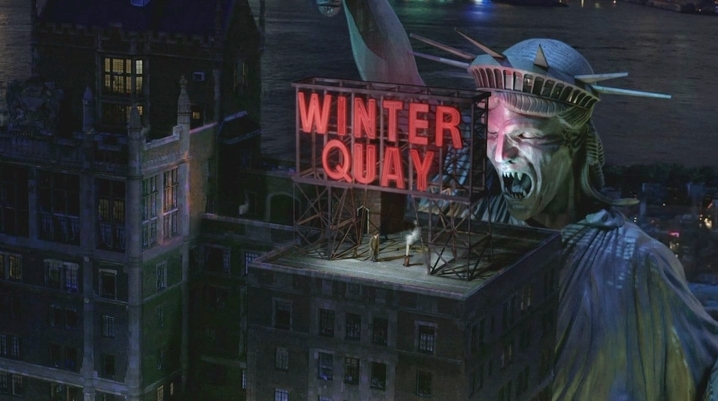 She risked death when she leapt off the building with him, which the ever dying Rory’s quip about how he always comes back from death was amazing there, and then put blind faith into hoping the Angel would send her back to the same place as it just sent Rory. Rory had died so many times in the series for Amy that it was basically Amy’s turn to die for him. They are the epic love story that so many other shows wish they could have and often times try to force the concept of one down our throats when they can’t pull it off. Amy and Rory are not teenagers, they’re adults who’ve been through hell and back and lost each other several times. They’re a unit and there’s no better way to end their journey than with the Doctor than knowing they were together until the end. 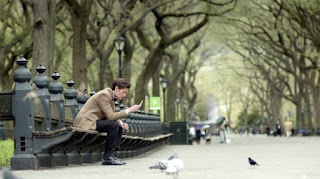 It was sad to see Amy and Rory go, but on the same note change is good. I like seeing new companions and new regenerations of the Doctor, and how they twist and change the character we’ve grown to love. However, we’re given a hint that while this is the end of Amy and Rory it won’t be the last time we see River Song. I look forward to seeing her interact with whatever future companions she might encounter, as well as their reactions when they meet the Doctor’s wife.